With so much conversation about preparing children for the rapidly changing world they will inherit, I have wondered why there is so little programming yet available in schools related to careers or vocations. Yes, there are high schools with work study programs or vocational training, but very little in K-8 schools. Striving to take seriously a commitment to making learning relevant, my school has designed a career related electives program for seventh an eighth graders, aimed at enabling our students to consider their possible future work lives in an interactive, engaging manner. Electives will be taught twice a week by teachers in our own school. 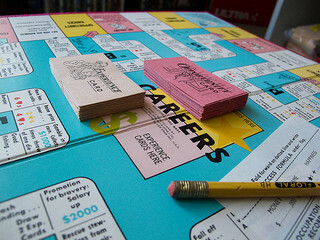 Each elective will involve students in collaborative projects utilizing skills needed for the particular career about which they have chosen to learn and will include a social action component helping students consider ways the skills of the career can be used to make a positive impact for others. Our career related electives are (in alphabetical order): Business; Education; Graphic Design; Health and Fitness Science; Medicine; Psychology/Social Work; Technology: Making, Tinkering, and Innovating; and Theater/Entertainment Industry. Descriptions of each course are provided below. This course will focus on the area of Marketing and bring in the financial implications relating to the goods and service being marketed. Marketing focuses on the methods,policies and institutions involved in the flow of goods and service from the producer to the consumer. Activities such as product development,research,communication,distribution,pricing and service are core marketing activities.During the school year we will study each if these activities. As mentioned the cost of the development of the product and it’s financial implication will be discussed. Students will develop an understanding as to why items are distributed and marketed the way they are. They will understand the challenges of competition in the marketplace. The class will be divided into a number of groups for a project where each group will introduce a new product and they will develop the marketing plan for this product from the research and development stage through distribution. Related subjects studied will include Finance, Advertising and Consumer Behavior. Our own school will serve as our lab as we explore the field of education. Students will have the opportunity to participate in “learning walks”, a professional learning approach in which educators, in this case our own students, observe learning in classrooms and then reflect together on what they observe. Prior to the learning walk foci to explore are selected from a range of potential areas including student engagement, physical design of the classroom, opportunities for individualized learning, opportunities for collaborative learning, integration of technology, evidence of student learning, and more. Students will learn techniques of observation, reflection, and lesson planning. They will provide individual or small group support in classes with younger children and receive feedback on their work. Students will collaboratively prepare a lesson, using a professional learning approach called lesson study, which originated in Japan. Each student will then teach the lesson they have created collaboratively in one of our younger grades. Students will observe each other teaching the lesson and offer feedback to one another using a professionally designed protocol to promote respectful, professional reflection and learning. Graphic Design is about how you interpret your visual world. It is problem solving and sometimes making something really cool in the process. Everything that is not made by nature is designed by an artist. Graphic designers produce the labels on every product from shampoo bottles to a carton of milk. In this course we will design book covers, tee shirts, street signs, posters and logos, while incorporating color, form and symmetry in the designs. We will plan together ways in which our creations can be donated in order to benefit others. Combining physical therapy, neurology, and martial arts, students will explore the way in which health and fitness science can positively impact the lives of individuals living with illness and disability. Students will explore therapeutic physical fitness, with emphasis on the martial arts. They will apply their learning through organizing martial arts therapeutic programming for children with a range of illnesses and disabilities. This course will begin with the history of medicine, from ancient (Egyptian) times to the present, including the difference between today’s conventional medicine and holistic medicine. We will continue with a brief introduction to the two main areas of medicine we will be discussing (Nursing and Medical Physician), including the education necessary, different degrees available, and specialties. We will additionally discuss ways in which medical professionals make a positive impact in their communities and consider volunteer opportunities in the medical field. Specialties we will explore for both Nursing and Physician: Medical/Surgical,Trauma, Obstetrics, Pediatrics, Geriatrics, Internal Medicine, Dermatology, Orthopedics, Hematology, Oncology, ICU & CCU, Pulmonary Medicine, and Psychiatry (and how it differs from Psychology). This course is designed to provide students with an initial exposure to the field of psychology. Students will learn the diagnostic criteria presented in the Diagnostic and Statistical Manual-V for several mental health diagnoses. We will use media, literature and other sources to assess portrayals of these mental health illnesses. Examples of this may include TV shows such as Monk, Seinfeld, and Private Practice as well as books. Students will assess the accuracy of these media portrayals. Additionally, we will discuss the mind-body connection and how one’s mental health impacts physical health/performance. This will include how it impacts learning as well as a section exploring the impact of psychology on athletic performance (sports psychology). We will use real life examples to illustrate these points and will bring in guest lecturers as well. In this course, students will have access to the latest hands-on technologies and the opportunity to invent something that interests them. Students will be given the chance to transform from passive receivers of knowledge to real-world makers who are empowered to design, build, and share their own amazing artifacts. They will consider ways their inventions can be used to make a positive impact in the lives of others. The industry has a wide variety of career opportunities including specific areas of theater production, performance and management. This course will include theater history, a closer look at Broadway and the many different theater career opportunities that exist today. This course will culminate in a collaboration of writing and producing an original short play that will be performed and enjoyed by an audience that would benefit from its presentation.